← Weddings, friends and… Californian Sangiovese?? It is one of the world’s great football regions, one of the world’s greatest food regions, but how often do we hear about the fantastic quality of Catalonian wine? Thanks to your great taste and voting prowess dear readers, the next two weeks will provide us with an opportunity to put Catalonian wine in the same exalted category as it’s food and it’s ball skills. We will explore one of the most exciting wine regions in the world, learning about red, white, rosé and fizz alike; if you have been on the January wagon, you couldn’t pick a better time to fall off! 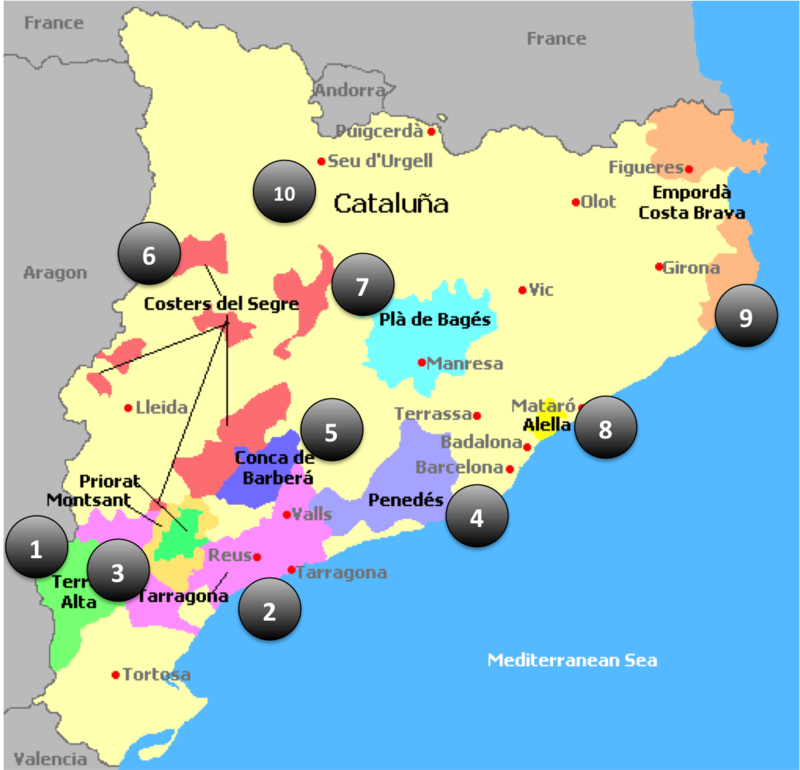 There are a total of 11 DOs and one DOQ in Catalonia, which sounds great, but what does that really mean? Denominación de Origen (DO) is the Spanish classification system for quality wine regions, similar to AOC in France (Appellation d’Origine Contrôlée). What the DO does is to guarantee that the wine comes from where it says on the label, is made from the grapes allowed in that region, and is made within the (often ridiculously high) yield limits. Spain is a high quality producing country, but nearly 2/3 of the vineyards are now within the DO boundaries, which suggests that maybe the DO isn’t the greatest barometer of quality (just look at some of the rubbish coming from Rioja these days). DOCa (Denominación de Origen Calificada) is the highest classification in Spain and Priorat, in Catalonia, is one of only two, the other being Rioja (see comment above!). 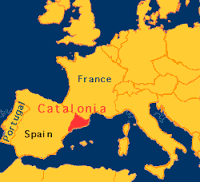 But because this is Catalonia, even that isn’t so simple as the Spanish DOCa becomes the Catalonian DOQ (Denominació d’Origen Qualificada)… but they are the same thing. I will come back to Priorat later on. First, lets take a look at the 11 DOs, starting with Cava. These things are never easy are they! Although Cava is a recognised DO, the allowable ‘region’ is actually of collection of wine regions. 95% of the production comes from Penedes in Catalonia, with the remainder coming from Aragon, the Basque Country, Castilla-y-León, Extremadura, Navarra, Rioja and Valencia. The quality of Cava just gets better and better (as we learned in #newwinethisweek Week 25 last year), the combination of Xarel-lo, Macabeu and Parellada grapes (along with a few others) making some very fine fizz that is being acknowledged all across the wine drinking world. 2. Tarragona DO – Tarragona forms and unusual ‘U’ shape on the map after the Montsant DO was created from the original Montsant region in 2001. Tarragona enjoys an interesting and noble history the region that produced much of the altar wine used for Christian sacraments and ceremonies; to this day the region continues to export church wines. The region is perhaps best regarded for it’s Cava and Rosado (made from Garnacha) these days. 3. 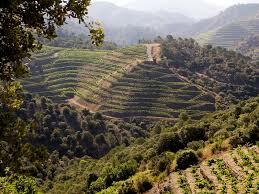 Montsant DO – the vineyards of Montsant are steep and terraced, making for backbreaking work. The region has a quality reputation for producing red blends featuring Garnacha and Cariñena from very old vines. There are an increasing amount of international varieties finding their way into these wines, as seems to be case the world over these days. 4. Penedes DO – the biggest individual region in terms of vineyard area and volume output, Penedes produces fizz, red and white wines. As mentioned earlier, 95% of Cava comes from this region, but ignore the still wines at your peril. When we were on holiday in Barcelona we drank a number of fantastic wines featuring local grape varieties (Garnacha, Cariñena) but also some brilliant Chardonnays and Rieslings. 5. Conca de Barbera DO – a new one for me this, the Conca de Barbera DO was created in 1985. The region is mostly known for producing grapes for Cava production but has a growing reputation for red wines features the usual Catalonian suspects Garnacha and Cariñena. 6. Costers del Segre DO – another new one for me, the Costers del Segre DO was created in 1986. Like Conca de Barbera, the region was mostly known for growing grapes for Cava production but made a name for itself by becoming the first DO in Catalonia to authorise the use of international varieties. These world superstars are blended with local Ull de Llebre (Tempranillo), Garnacha, Monatrell, Trepat and Cariñena (known as Samso in Costers) to produce quaffable, early-drinking red wines as well as wines that will age for years. 7. Plà de Bages DO – this small region acquired its DO status as recently as 1995 after some hard graft by a few top quality bodegas. The region crafts red wines from the usual Catalonian line-up but is getting reputation for it’s white wines, which often feature the local Picapoll grape (better known to us as Picpoul from the Languedoc) along with Chardonnay and Sauvignon Blanc. 8. Alella DO – Alella is a “blink and you’ll miss it” kinda DO with a reputation for producing crisp white wines made from Xarel-lo (known in this particular DO as Pansa Blanca), Garnacha Blanca and Viura. The DO was created as far back as 1956. 9. Empordà DO – the region was awarded DO status in 1972 as Empordà Costa Brava and become simply Empordà in 2006 (I can’t find the reason why it changed). The key grapes in the region are Garnacha and Cariñena, which these days grow alongside Cabernet Sauvignon, Merlot, and Syrah to produce tinto and rossado wines. The Garnacha is also used to make a very decent and sticky dessert wine. 10. Catalunya DO – this was the first regional demarcation in Spanish wine and covers the rest of the vineyards in Catolania outside these DOs, making very decent wines that can be found on any wine list in Barcelona! I have left the best until last. Priorat DOQ, one of only two Denominació d’Origen Qualificadas in Spain, is one of my very favourite wine regions not only in Catalonia or Spain, but anywhere in the world. My love affair started in autumn 2012 when it was brought to my attention by a sommelier at Gidleigh Park; she was French and when I asked her what she was buying for herself she replied “Priorato” (a French sommelier not recommending French wine FFS!). A couple of months later I found myself in Barcelona for a long weekend and asked the guy behind the bar to recommend a bottle of red to savour as we watches the evening unfold; I paid around €40 for a bottle of Somni 2009 and have never looked back. The region has a great story to tell. Although there is evidence of viticulture in the region from the 12th century, the DO itself was only formally created in 1954. Pre-phylloxera there was around 5,000 hectares under vine in the region; the number had dwindled to under 600ha in 1979. But all of this changed in the late 1980s when a group of five growers got together and shared a winery in Gratallops; they became known as the “5 Clos”: Clos Mogador, Clos Dofi (later renamed to Finca Dofi), Clos Erasmus, Clos Martinet and Clos de l’Obac. This was the start of a golden age for Priorat that has kept on going and is thriving today. The planted area had expanded to 1,800ha in 2009, still tiny compared to 123,000 in Rioja or even the 18,000 in Ribera del Duero. Although the wines of Priorat come with a hefty-ish price tag, they are very reasonable if you’re comparing to the fancy appellations of France and the consistency is extremely high across the board. I am a Garnacha man first, Cariñena second and I love the balance of power and finesse the region has to offer. It’s going to be a good week. Posted on February 12, 2015, in Uncategorized. Bookmark the permalink. 7 Comments. Very well done by Confessions of a Wine Geek, Catalonian wine in 1,500 words! Great subject material and so much to say! Love this post – such a beautiful wine region. Thanks for sharing! Hi Ant! I’m researching Catalonia in preparation for a trip in August and your map was one of the top results. I’m glad it drew me back to read your posts. Cheers! Cheers Conrad! It’s an amazing place you’ll love it. Not much writing going on now we’ve opened our wine bar – must try harder!! If I’m ever over Cheltenham way when in the UK I will drop in! I’d expect a good line up of English wine of course… 😉 Good luck with it all !! !